I’ll admit something to you all that not too many people know about me: I still eat peanut butter and jelly sandwiches. Like… a lot of them. At least a few a week. And much like a child, I only use creamy peanut butter and it must be grape jelly. Don’t even try to give me any of that raspberry or strawberry fancy business. Sometimes, when I’m out of bread, I improvise with my PB&J situation. I’ve slathered PB&J on all kinds of random stuff. One day when I was out of all of these things, I tried it out with tortilla chips. The salty and sweet combo of these peanut butter jelly nachos worked out better than expected so I figured I would share the idea. 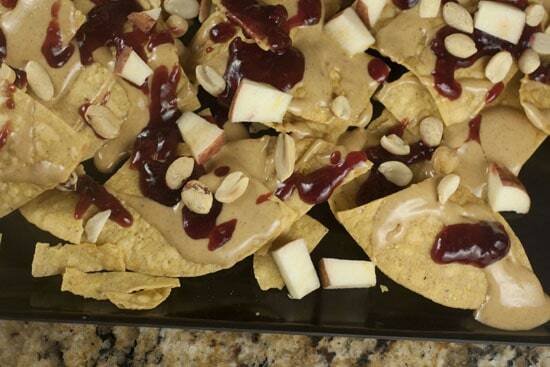 Peanut Butter Jelly Nachos are a fun and delicious way to serve peanut butter and jelly. Ditch the bread and break out the tortilla chips! So yummy! 1) Add peanut butter to a small pot with about a tablespoon of water. Heat over low heat, stirring regularly. 2) Add jellies to a separate small pot with a tablespoon of water to loosen the jelly. Heat over low heat, stirring regularly. 3) Lay out tortilla chips on a large serving platter. 4) Don’t bring the peanut butter or jelly to a boil or simmer. Just heat it until it relaxes and is pourable. 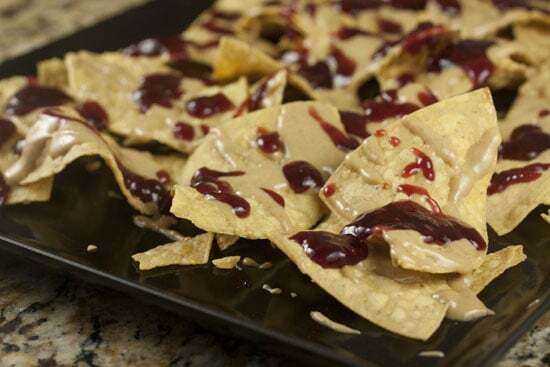 5) Drizzle peanut butter over tortilla chips, followed by warm jelly. You may not need all of it. 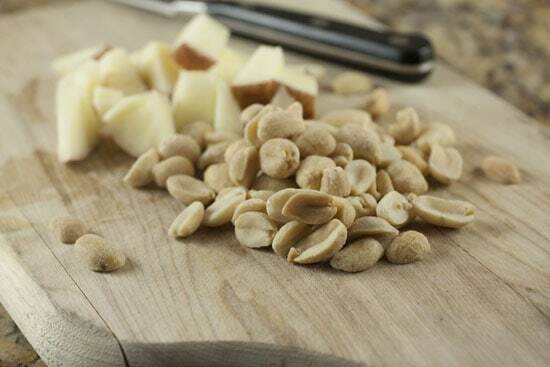 6) Top with chopped apples and whole peanuts. Serve immediately! 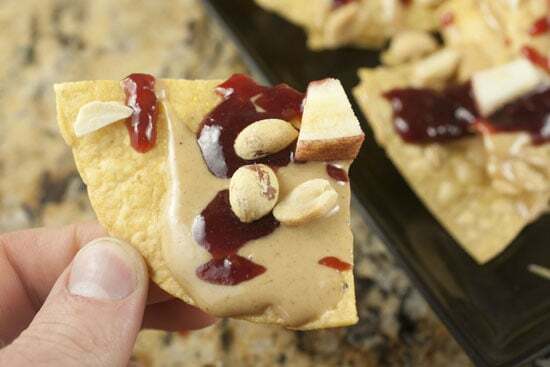 I like this peanut butter jelly nachos recipe a lot because it’s really simple, very fun to serve, and gives you an opportunity to use all the little bottoms of random jelly that I know you have in your fridge. I just combined a few different jellies together for my version and it worked great. While you could just drizzle PB&J on chips and end up with something pretty tasty, there’s an opportunity to toss on some toppings. I went with a chopped apple to give it some crunch and extra fruitiness. Also a handful of salted peanuts adds another layer of textures. I’m sure you could use a lot of different toppings for these, but I kept this version pretty simple. Peanut butter and jelly doesn’t exactly drizzle well. It spreads well which is great if you are using bread or something. But nobody wants to spread dozens of chips with tiny amounts of peanut butter and jelly. So, it helps to make a kind of sauce with the stuff. Basically, I just heated up my peanut butter and jelly separately in a few small pots. 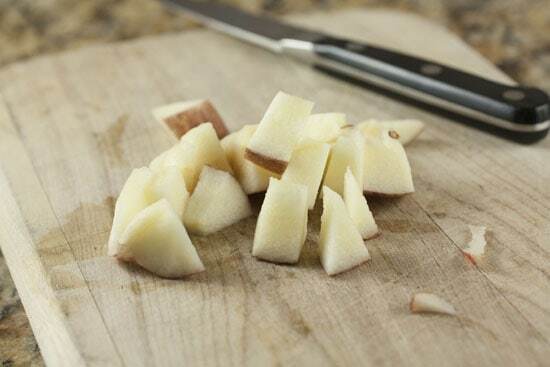 I added in about a tablespoon of water to each just to loosen them up a bit. As they heat they will become more liquid and easier to work with. Don’t bring these to a boil or anything. Just use a nice low heat and when they are hot and easy to pour, they are done. 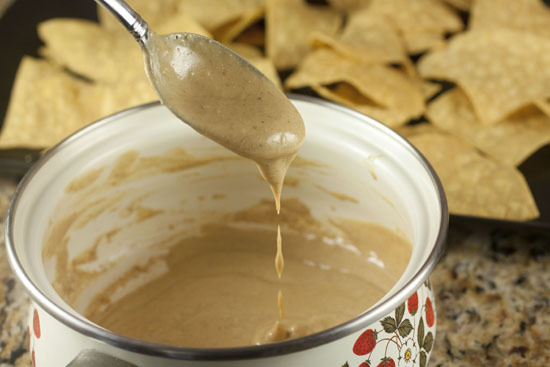 Once you have your PB&J ready, just lay out a nice layer of tortilla chips on a serving platter and drizzle each sauce over the chips. Then just sprinkle on your toppings and you’re ready to rock and roll. As with real nachos, the perfect chip has just a little bit of everything. 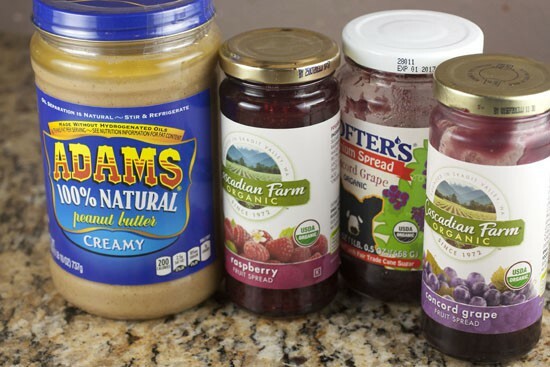 If your kids are PB&J fans, give these a shot next time. 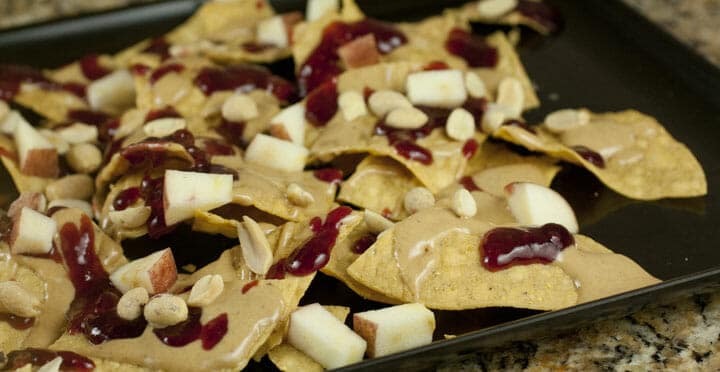 They are quick to make and you could feed a crowd of hungry kids with one platter of these peanut butter jelly nachos. Is it madness or genius? Probably both! Haha, I love it! Again, you’re a genius! Never would have thought to do this, but I bet it would be a hit with kids and adults alike! i eat a lot of pb&j too. This looks vaguely disgusting and yet probably tastes pretty good. I’d love to try this with jalapeño blackberry jelly–my new fave! That jelly sounds good though. Dessert nachos! Any time is a good time for nachos. I’ve been away a while and when I return I see you are still knocking then dead with fantastic, creative ideas. My lunch is in the pan! That is just sooooooo wrong………. First, I saw your cool ranch Doritos on Pinterest and thought – wow – this guy is creative in the kitchen and actually makes an effort for his junk food. Then I saw your homemade tatertots and thought – who is this guy? I must find out more. So I entered your blog and found this post about PB&J Nachos and laughed right out loud (there were tears, my husband can witness). All I can say is You. Are. Awesome. Cook on, man! I love this, and do this all the time!